In recent days we have seen a number of BBC programmes broadcasting ‘special editions’ from Jerusalem. While the benefits to the BBC’s funding public of flying presenters of domestic programmes such as Radio 4’s ‘Today‘ and ‘Sunday‘ out from the UK for a jaunt to Israel may remain a mystery to many, the May 11th edition of Radio 4’s ‘World at One’ provided a prime example of the perils of ‘parachuting’ reporters into an environment with which they are less than adequately familiar. Presenter Mark Mardell introduced the item (from 27:49 here) with what was by that time an inaccurate claim regarding a “high alert” in northern Israel and a decidedly presumptuous prediction of its continuation. Interestingly though, he had nothing at all to say about the missile attacks by Iran against Israel the previous day. Evidently – and not only in this programme – the BBC has elected to ignore the fact that Israelis celebrated the 70th anniversary of their country’s independence on April 19th and instead has adopted the staggeringly patronising policy of deciding for itself (in a manner similar to that in which it presumes to decide where Israel’s capital is – and is not) that Israel’s independence day should be marked according to the Gregorian calendar rather than the Hebrew one. Listeners then heard an archive newsreel recording in which the founders of the Jewish state were portrayed as “lawless” and “thugs” – a recording which was also used by the BBC in the same programme last month. Stourton then introduced his two guests – Sami Adwan from Bethlehem and Israeli ‘new historian’ Tom Segev – who, unsurprisingly, expressed remarkably homogeneous views. Listeners heard Adwan claim that in 1948 Palestinians were “deprived from their national rights…their rights, their resources and their property, their places”. Awad went on to claim that “they were expelled without any reason, without any cause”. Stourton – whose sole response to those claims was “well indeed” – refrained from clarifying to listeners that the overwhelming majority of Palestinians who left in 1948 were not driven out by the Israelis, but left of their own accord – often because they were urged to do so by their own leaders. He likewise failed to mention that the Palestinians were not the passive actors portrayed by Awad, but also took part in what was intended to be a war of annihilation initiated by the Arab states and then he went on to give a context-free portrayal of the Six Day War. When Adwan went on to claim that “the British, the Israelis are responsible for our catastrophe”, Stourton made no effort to question him on the topic of Arab and Palestinian responsibility. Listeners heard highly partisan portrayals of the relocation of the US embassy to Jerusalem from both Stourton and Segev, with the latter describing it as an “unnecessary development” and opining that the Palestinian refugee issue is a “burden…on our [Israel’s] morality and on the justification for the existence of Israel”. When Adwan later presented a partisan view of the UN Partition Plan, Stourton failed once again to inform listeners that the proposal was rejected by Arab leaders – including representatives of the Palestinians – and hence has no relevance. Obviously the aim of this unbalanced and partisan report – riddled as it was with important omissions and inaccuracies – was to advance the narrative of “disputed history”. No effort was made to get beyond that falsely ‘balanced’ label and to provide Radio 4 listeners with accurate and impartial information that would enhance their understanding of a complicated story. Nevertheless, one would expect that if the BBC is going to go to the expense of sending UK based journalists abroad to report on a story off their usual beat, it would at least ensure that they are au fait with the basic historical facts and ensure that they provide them to the corporation’s funding public. On June 8th BBC Radio 4 listeners heard two reports from the latest BBC correspondent on a flying visit to Israel – Hugh Sykes. The first of those reports was broadcast on the “World at One’ programme (from 14:30 here). Presenter Mark Mardell gave an introduction devoid of any context concerning the reasons for the outbreak of the Six Day War. Of course BBC regular Daniel Seidemann is not just a “lawyer”: he is also the founder of two politicised campaigning groups – ‘Ir Amim’ and ‘Terrestrial Jerusalem’ – both of which receive foreign funding including, in the case of the latter, from the UK tax payers listening to this programme. Despite the existence of BBC editorial guidelines stating that the “particular viewpoint” of contributors should be made clear in advance to audiences, Hugh Sykes makes no effort to clarify Seidemann’s political agenda and links to politicised campaigning NGOs to listeners before they go on to hear that contributor’s cliché-ridden statements. Obviously any serious examination of this topic would at this point go on to address the issue of what happened after those 8,000 Israelis were uprooted from their homes and livelihoods in the Gaza Strip (along with residents of four communities in northern Shomron which Sykes and his guest appear to have forgotten) twelve years ago. Such a discussion would have to address the fact that the move did not advance peace and in fact the number of terrorist missile attacks on Israeli civilians increased. It would also have to address the fact that international bodies and nations which lauded the Gaza disengagement, promising understanding should Israel subsequently have to act against terrorism in Gaza, quickly swapped that pledge with condemnation. Sykes, however, chooses to ignore those inconvenient facts, opting instead to reinforce his messaging. Remarkably, only the Jewish “absolutists” in Sykes’ portrayal are religiously motivated. Obviously this report is yet another contribution to the campaign of opportunistic politicised messaging already seen on the BBC News website. It too advances a narrative according to which the modern-day conflict is exclusively rooted in the outcome of the inadequately explained Six Day War – in particular the ‘occupation’ and ‘settlements’ – while erasing from audience view the underlying and far older refusal of Arab states and Palestinian leaders to accept and recognise the existence of the Jewish state. Sykes’ second report of the day will be discussed in a future post. On January 11th the BBC Radio 4 programme ‘The World This Weekend’ focused entirely on the subject of the terror attacks in Paris and that day’s rally, with presenter Mark Mardell reverting to the usual BBC’s usual ‘value judgement’ free formula for describing terrorists in his introduction. But the most notable part of this programme comes at 24:05 onwards when Mardell brings in two interviewees but only finds it necessary to signpost the political leanings of one of them, whilst refraining from providing any insight into Kundnani’s place on the political map. As we see, Mardell makes no attempt to interrupt Kundnani’s bizarre monologue in order to relieve BBC audiences of the inaccurate impression that Israel has deliberately killed journalists. Fortunately, a journalist with honesty and integrity happens to be on hand. If it is established during a live programme that a factual error has been made and we can accurately correct it then we should admit our mistake clearly and frankly. Saying what was wrong as well as putting it right can be an important element in making an effective correction. Where the inaccuracy is unfair, a timely correction may dissuade the aggrieved party from complaining. Any serious factual errors or potential defamation problems should be referred immediately to Programme Legal Advice. How fortunate that Rene Girard was on hand to do the BBC correspondent’s job for him. 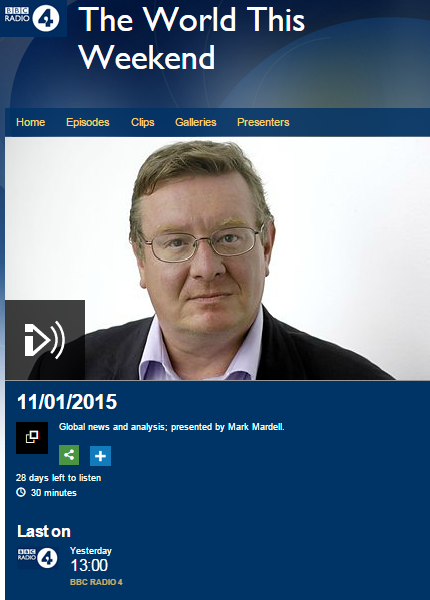 Does the BBC’s Mardell think the language spoken in Israel is called “Israeli”? One of the BBC journalists flown in to Israel especially for the occasion of the visit by President Obama was the North America Editor, Mark Mardell. 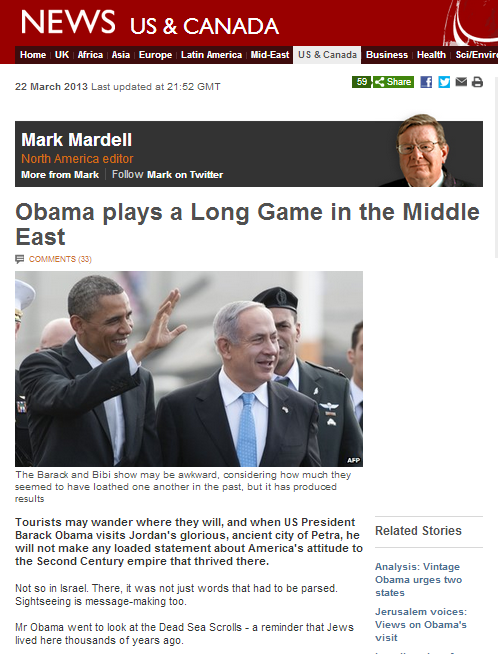 On March 22nd Mardell produced an article entitled “Obama plays a Long Game in the Middle East” in which he gave his summing up of the presidential visit. Mardell spends a considerable part of the article advancing his own rather flowery interpretations – psychological and otherwise – of Obama’s words and actions during the trip, but one rather bizarre sentence stands out. Readers of the article can either choose to despair over the fact that a senior BBC journalist does not know the name of the language spoken in Israel or to wonder why – if Mardell was intending to say that Obama had been urged to learn to understand the Israeli viewpoint and how to communicate effectively with the Israeli people – he did not manage to make that clear either by better choice of wording or by means of appropriate punctuation. Whichever interpretation of that sentence – literal or figurative – one elects to adopt, Obama’s “fluency” is obviously seriously over-exaggerated by Mardell, particularly in light of the fact that the President chose not to address the Israeli people as a whole through their elected representatives, but instead played safe by speaking to a carefully selected audience which excluded certain sectors of the public in advance. As for the rather bizarre – and unexplained – use of the words “almost frightening”, one can only speculate as to what would scare a BBC correspondent so much about the possibility of a US President being able to communicate with the people of another country. Mardell’s article – which appeared in both the Middle East and US & Canada sections of the BBC News website was opened for comments by the BBC. Once again, a lack of appropriate moderation on that thread meant that the BBC made itself complicit in the spread of antisemitic discourse.